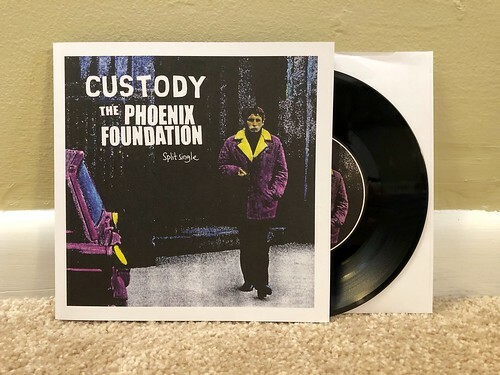 I Buy Way Too Many Records Dot Com: Custody / The Phoenix Foundation - Split 7"
Custody / The Phoenix Foundation - Split 7"
I've been anticipating this 7" for quite some time. When Custody came to the US for The Fest, I was lucky enough to hear their song on this split live when they band played a show in New Jersey. As soon as I heard "Tuesdays" I loved it and I let the band know how much I thought it should come out on PopKid. While things didn't pan out for that, I'm still very excited to have this 7" in my collection, even if it's on another record label. "Tuesdays" is a classic Custody rocker. The way they channel a furious mix of 90s UK punk sounds and a Samiam style melody always blows me away. This is a band that can just do no wrong right now. Every song I hear by them I love more than the one I heard before (except for "Whatever We Decide," that one is still the best). Phoenix Foundation is a band I've been buying records of for a really long time. I first heard of them through a release they had on Snuffy Smile in 2004 and it's great to see them still putting out records. Their last full length from 2017, Closer, was outstanding and is worth hunting down. Their contribution to this split is "Secrets." It's a great song, but it is kind of long. We're talking six and a half minutes long and the vocals don't start until two minutes in long. The songs itself is terrific, but can't help but feel I'd probably like it more if a bit was shaved of the intro at lease. That's probably a fault of my attention span though and not the song itself. Browntrout - Blues, Blues, Blues 7"